An orchestra’s conductor is a remote and mysterious figure. Known to the listening public for intensity of gesture during a concert and expansive waving after it, he seems rarely to speak. Leonard Bernstein was an exception at the New York Philharmonic, forever interrupting rehearsals to tell a story about what happened at so-and-so’s place and giving introductory remarks before Thursday-night previews. Bernstein’s spiritual successor, Gustavo Dudamel, is similarly voluble in Los Angeles. But more often, the legendary conductors appeared before the public as quietly intimidating figures, almost mythological in stature. Sir Georg Solti was a grand and slightly menacing presence at the podium of the Chicago Symphony Orchestra. Arturo Toscanini could silence Carnegie Hall with one dangerous stare. Mr. Ozawa returns again and again to his teachers and is quick to give them credit for his success. They happened to be three of the great conductors of the 20th century: Hideo Saito, Herbert von Karajan and Bernstein. Much is revealed in the way Mr. Ozawa refers to them, respectively, as professor, maestro and “Lenny.” Saito, whose renown was greater in Japan and Europe than in the U.S., was a demanding pedagogue who would direct his students to sit down with blank score paper and spend an hour writing from memory as much of a given symphony as possible. He also taught Mr. Ozawa that the way he moves the baton in performance matters less than the way he does so in rehearsal. Karajan, the legendary Austrian maestro, was the very picture of a conductor. Handsome under his perfect silver hair, glamorously draped with a cashmere sweater, aloof, vain, severe in his pronouncements, precise in his movements, he was a tremendous artist. Mr. Ozawa recounts the way Karajan once scolded him for wasting his time cueing musicians. They are professionals who know how to count, Karajan explained. A conductor’s job is to find and accentuate the music’s phrases—the longer the better. Think not in two- or four-bar increments, he said: Look for 16- or even 32-bar phrases and make them soar. Karajan liked to record in a particular church in Berlin with favorable acoustics, and he memorized each score, conducting with his eyes shut. Mr. Ozawa speaks of him in reverential terms. And then there was Lenny: Lenny, who auditioned Mr. Ozawa to be his assistant over cocktails on a dive bar’s piano; Lenny, who alarmed Mr. Ozawa’s wife by tossing their newborn baby up into the air; Lenny, who gave Mr. Ozawa his premiere with the New York Philharmonic by spontaneously bringing him on stage to conduct the finale of Stravinsky’s “Firebird.” Bernstein’s brilliant and generous figure casts the longest shadow in this book. Under him, Mr. Ozawa got plenty of time with the orchestra. The best part of the job was to watch Bernstein “feverishly grappling with Mahler,” almost single-handedly bringing his music to the center of the symphonic repertoire. Mahler, Brahms and Beethoven are the primary composers under discussion, as Mr. Ozawa has made a special study during his career of the German Romantic masters. He has a remarkable ear, hearing on recordings the breathing habits of the flute section or the placement of microphones. “This wasn’t recorded at Manhattan Center, was it? At Carnegie Hall?” he asks as he and Mr. Murakami listen to a 1962 recording of Brahms’s Piano Concerto No. 1. “The sound is so dead.” (He was right about the venue.) Mr. Ozawa also reveals some of the rudiments and indeed hazards of conducting major orchestras. To keep the peace, his practice is to speak offstage to musicians about their solo parts. The booing is much worse in Europe—especially Italy—than in the United States or in Japan, where it is unheard of. Mr. Ozawa once stole several custom batons from Eugene Ormandy and broke his finger when his hand struck the music stand of a nearby tenor. Handsomely, Mr. Ozawa seems to remember the name of every musician he has ever conducted. Mr. Murakami stays in the background of these conversations, but his preparation and curiosity draw out Mr. Ozawa wonderfully. The novelist has a large collection of classical recordings and does not shy away from asking questions about matters that are basic for Mr. Ozawa but unknown to most readers. Who calls the shots in a concerto, he wonders, the conductor or the soloist? Mr. Ozawa replies carefully: It depends. 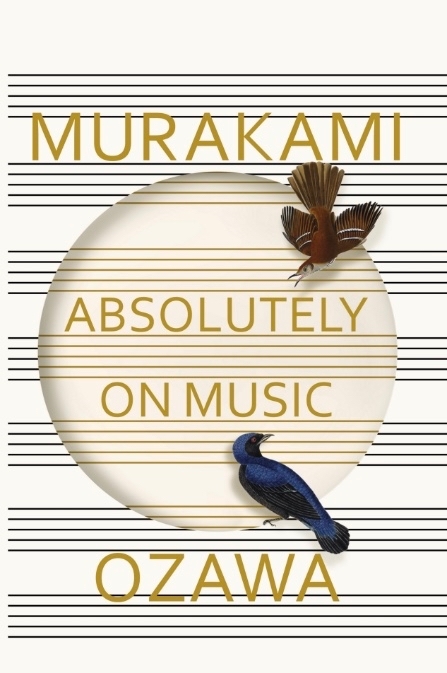 One point at which Mr. Murakami does take the stage affords a keen insight about the inherent musicality of prose. Rhythm is its most important component, he says: “The rhythm comes from the combination of words, the combination of the sentences and paragraphs, the pairings of hard and soft, light and heavy, balance and imbalance, the punctuation, the combination of different tones.” This is just right, and if the book has a flaw it is that this topic is not developed further. For all his warmth and openness, Mr. Ozawa is less interested in writing than Mr. Murakami is in music. But then, such is the maestro’s prerogative.